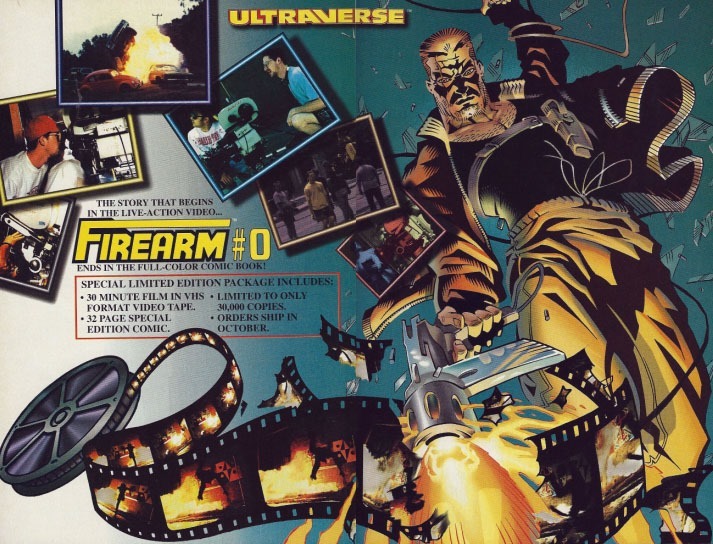 With the September 1993 Ultraverse books, we have our largest month yet for house ads…with the largest house ad yet in Firearm #0! It’s interesting to see four pages per (most issues) dedicated to this. 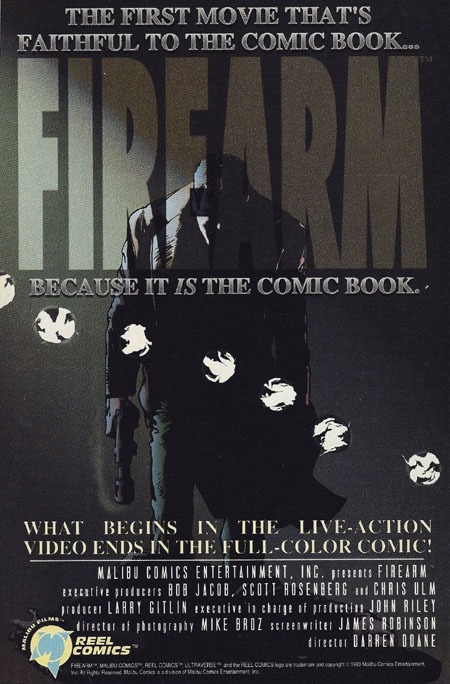 Rather than just a one-page piece advertising this video/comic combo pack, we have an opening page, a double-page spread, and a closing page, introducing us to this concept of a live-action video where the story starts in the video and concludes in a comic book! 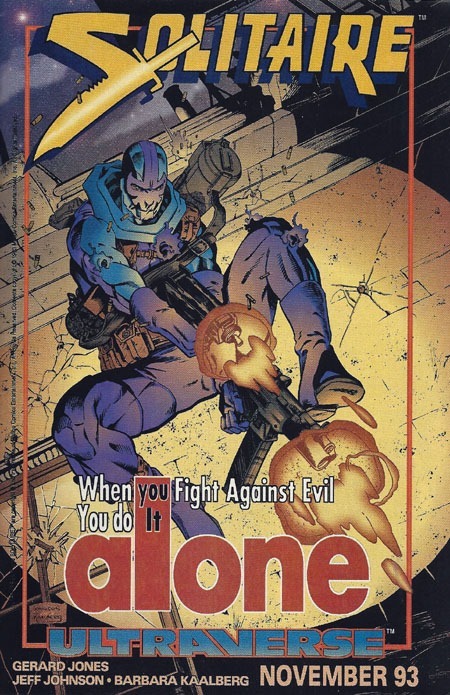 This was one of many interesting multi-media things Malibu did for the Ultraverse line, and to my knowledge remains a one-of-a-kind thing! 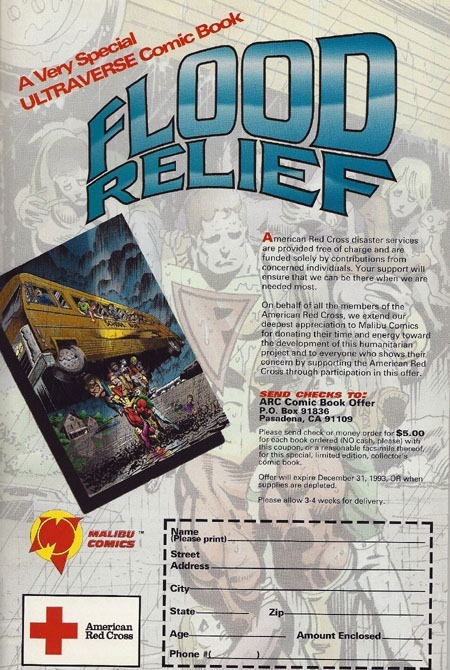 I’d forgotten how early on this Flood Relief issue came about. 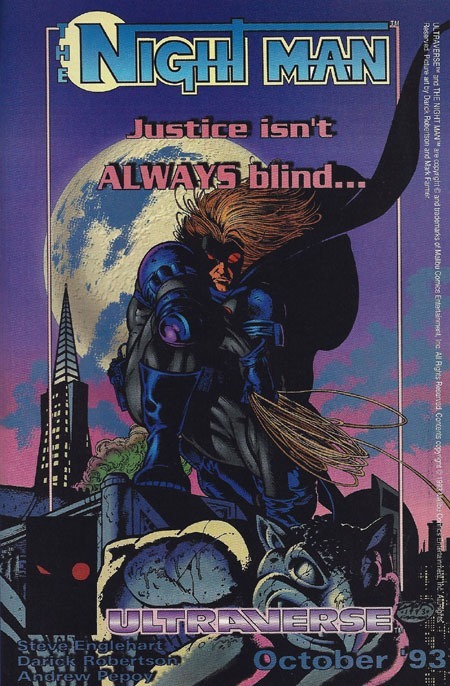 For a donation to the American Red Cross, one could get a special edition comic book featuring the Ultraverse. An interesting fundraising device. I have no idea how well it did, or how ‘limited’ it actually was. 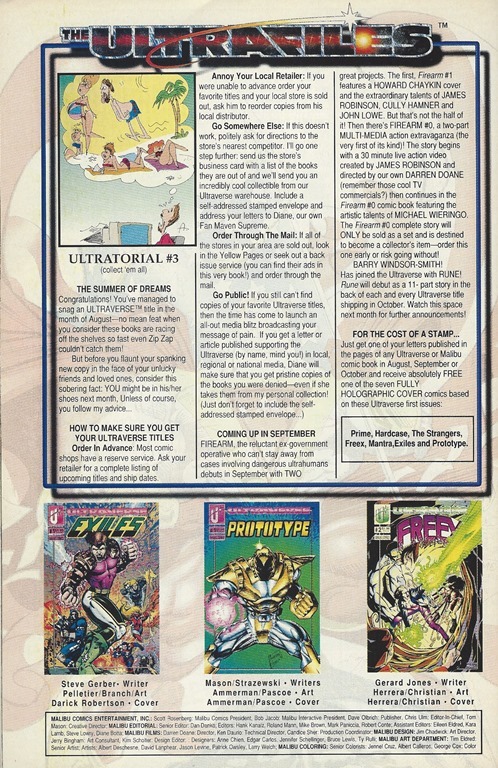 Offhand, this would be the second "mail-away for a limited-edition Ultraverse comic" promotion from Malibu. Where it seems all the other titles got ads ahead of time, I had noted for the August 1993 house ads that there’d been no ad for The Solution before its first issue was out. Instead of a "coming in September" we got an ad for it in September with the "On Sale Now!" note. I believe this is the first full-page ad for a title that is not a #1 issue. We had the split-page ad for several of the continuing titles, but this seems to be the first full-page ad. 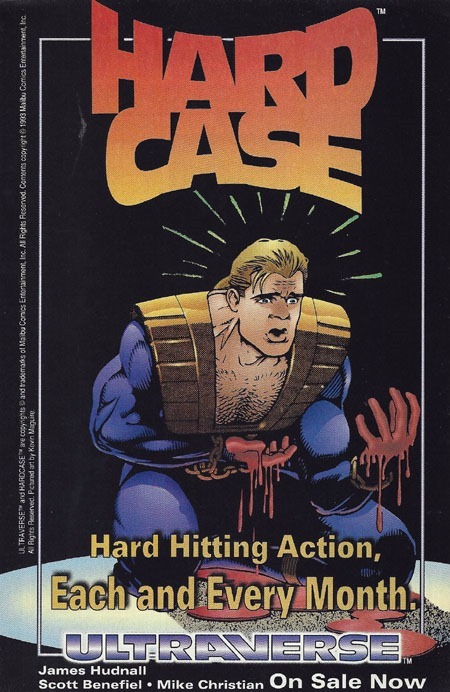 In this case, for Hardcase #5, coming in October 1993, part of the Rune Month stuff. Here the ad is just for the title but I recognize the cover image from the fifth issue! The Night Man is a new title that debuts with the October 1993 titles. 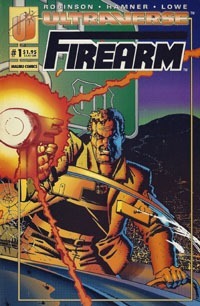 I’ve always been a fan of this cover and its coloring. That I can say that based on this ad is–as I’ve noted with previous such reflections–one of the things I really, really like with the ads. They are the cover image of the first issues, so you know exactly what you’re looking for! No arbitrary image to get confused over when there are several other images on issues when you just want THE first issue. This use of the cover images also helps make them that much more memorable and recognizable, and thus "iconic" in a way that publishers in 2018 seem to despise. 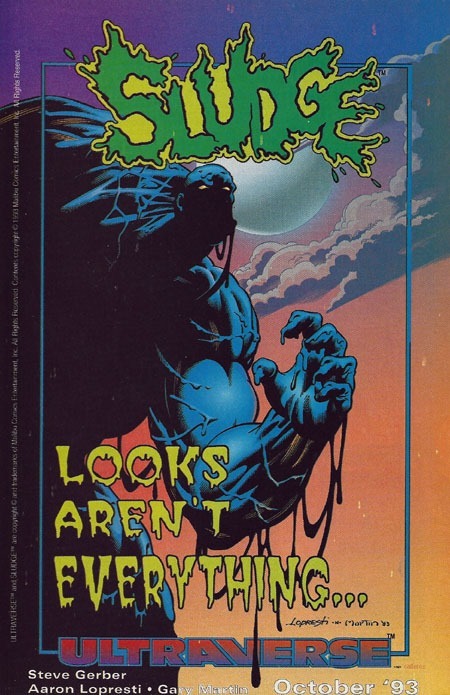 However, while I say that above about Night Man, this image of Sludge actually is not the first issue’s cover image–whether it was a last-second change or something else, I don’t know. Perhaps for nearly 25 years of knowing the actual cover, I think I prefer the actual cover of #1 to this…though this image gives a bit more to go on with the character, as the cover to #1 is an extreme close-up of Sludge’s face; here we see more of the (shadowed) body. But combine this ad with the actual cover, and there’s a bit more of an idea what one’s dealing with before ever getting past the cover of #1! Finally, getting a bit ahead of things, we have this Solitaire ad for November, giving us a look beyond "just" the very next month. 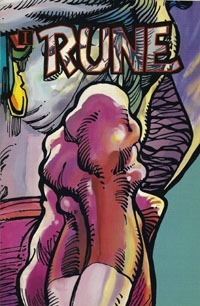 Of course, we already had that with the Rune ad previously, that basically only told us the character was coming (and in September 1993, Rune #1 was still some four months away!). There’s no mention in this ad of the polybagged-with-a-playing-card promo that would come with the first issue of Solitaire…I don’t recall if there ever was any mention of it outside of something like Wizard or Hero Illustrated. More on that at the end of covering the October books! 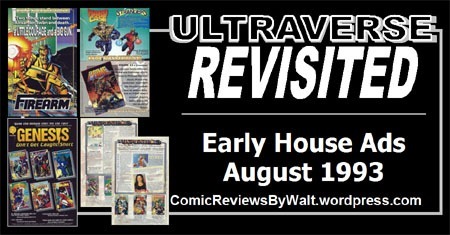 Here are house ads from the third month of the Ultraverse line: August 1993! 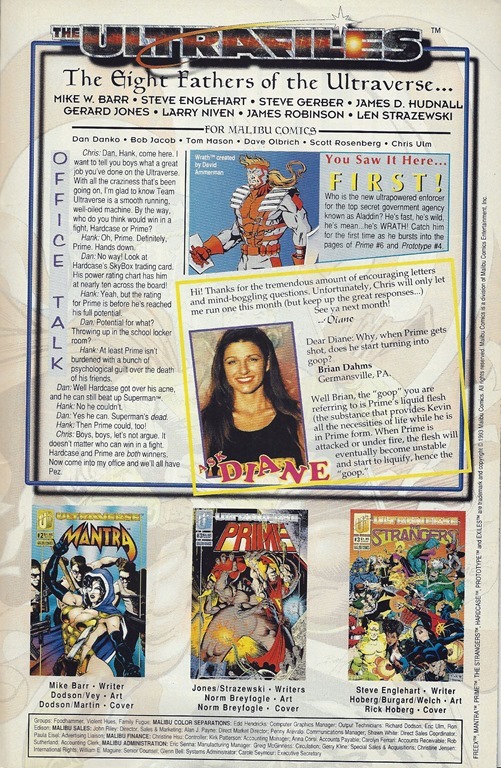 We have one full-page and one split-page ad for actual Ultraverse titles, one for the "other" group of Malibu titles (that preceded the Ultraverse line), and then the "Ultrafiles" pages which were all the same across the various titles. 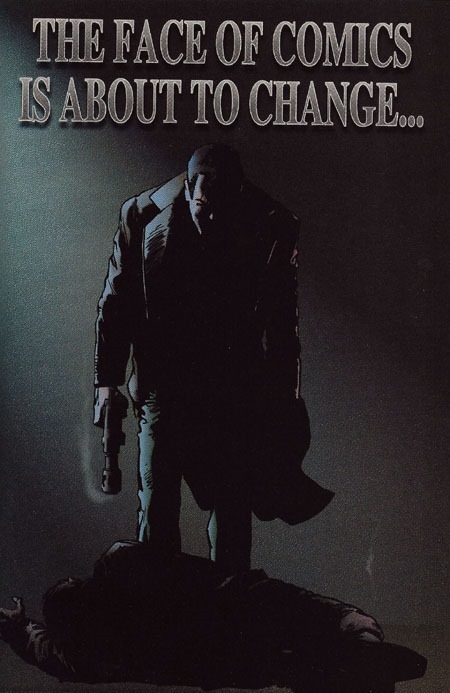 I’m almost certain this ad was the first I saw of the Firearm character. It’s certainly (to me) an "iconic" image–something far too lacking in modern comics! 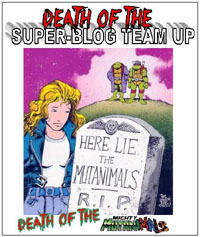 This title would be one featuring a "non-Ultra" dealing with a world of Ultras. Though I recognize James Robinson now by name, the name didn’t stand out whatsoever to me in 1993, where I barely knew creator names. I like the continued "tag line" nature of text on the ad…this would be right at home on an ’80s/’90s action flick. This is the first of the house ads to 1. feature multiple titles and 2. be for something other than a #1 issue. I like the use of the single page to show off three titles. Not every issue needs a full page, but seeing the stuff at all puts it or keeps it "on the radar" as well as showing at least part of an image to be on the watch for, in terms of covers. 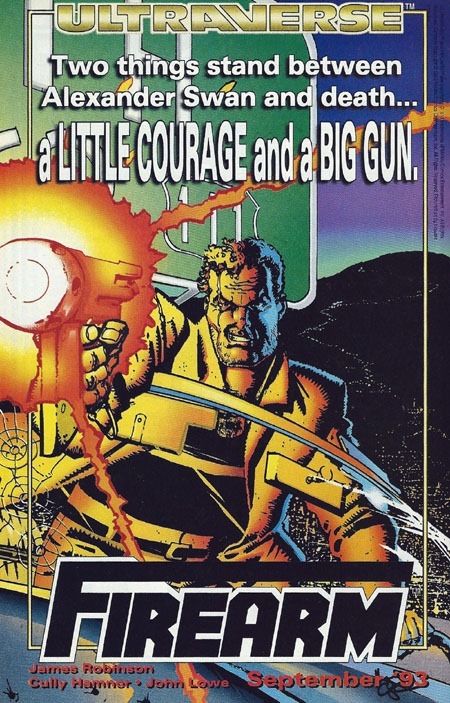 As with text on other ads, getting a "blurb" about the issues goes a long way in letting one know what to expect, to be "sold" on an issue along with having art from the cover(s). Genesis is not Ultraverse, but IS Malibu. I’m nearly certain this ad is what put most of these titles on my mental radar as a kid. 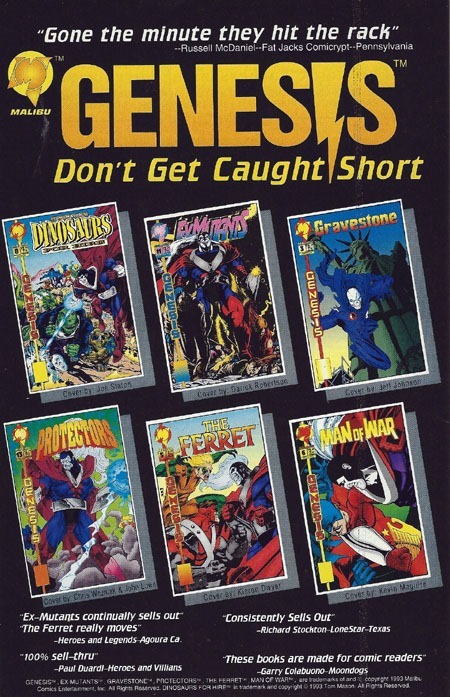 To this day, I don’t think I’ve gotten all chapters of this Genesis story arc, but I’ve certainly meant to, and probably have several duplicates by way of getting issues when I’ve seen them in bargain bins. Though this "line" went away not long after the Ultraverse hit, it’s one that I’ve contemplated digging into as a "finite universe" of issues. 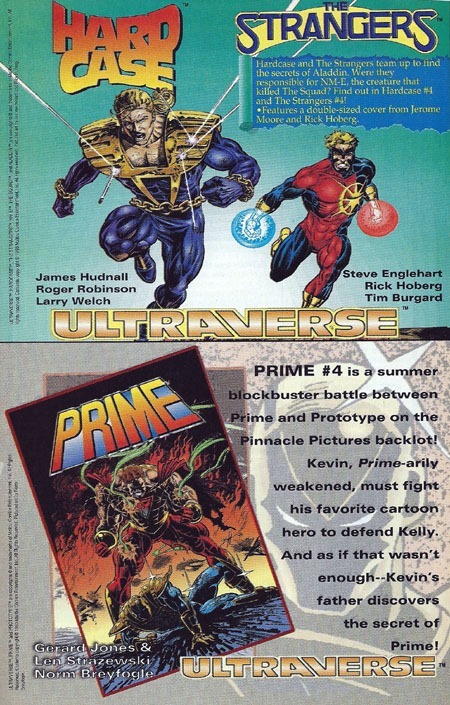 Whether I’ve known it in the past or not, I don’t consciously recall details about bringing these titles together as a group vs. the fresh launch of the Ultraverse, but that’s a topic I’ll surely research later for my own curiosity. Some things never change, and it’s interesting to me to see this "time capsule" bit of having to "pre-order" comics at a local shop to be able to get a copy. With only six covers displayed across the bottom of these pages, we’re missing the Hardcase cover. Not a huuuuge deal, but I would think with so few titles it could be worked in somewhere. The "preview" of the Wrath character on this second page is interesting: at first glance I thought it was Marvel‘s Omega Red. I’m sure it’s the hair/color and the red/white color scheme. Also, this is from the ’90s, where many visual designs seemed to feed off each other as ‘trends’ and such. 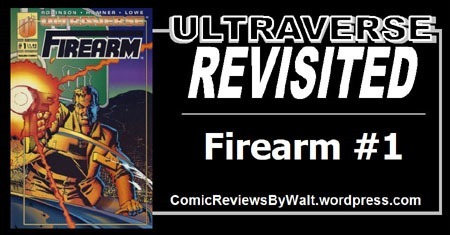 And here we are–another "month" of Ultraverse books completed! 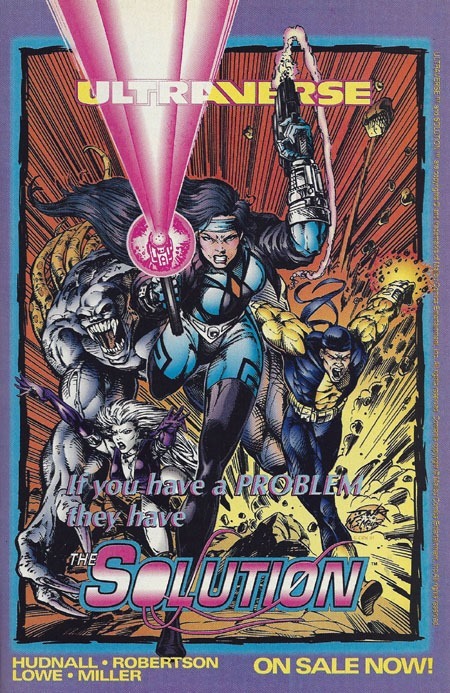 Not many house ads this time around, and I noticed that none of the titles had an ad for The Solution, which also premieres in the September 1993 group with Firearm. I strongly suspect that is part of how I initially missed the title. The ads certainly helped cement the first issue covers as "iconic" for me, and so it’s odd that one title out of 8 or so got "left out." 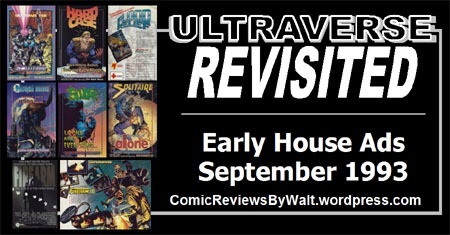 NEXT WEEK: I’ll begin Month #4 of the Ultraverse with titles released for September 1993! My local comic shop was having an “end-of-summer”/Labor Day clearance sale last week. A bunch of sale books and games and such, as well as extra bargain bins, and all the bargain bins–usually 25-cent comics–were 5-cents apiece or $12 to fill-a-box. On Wednesday, being there on my short lunch-break, I could only flip very quickly through a few of the bins, and found an issue of Siren and an issue of Necro Mantra/Lord Pumpkin; far as I can tell, the Necro Mantra/LP issue is new, while the Siren issue was a duplicate. But for 10 cents total…I can afford to take the duplicates’ chance. for $2; (and the week before, had bought a run of Steel for $6ish and Zen: Intergalactic Ninja for $8). 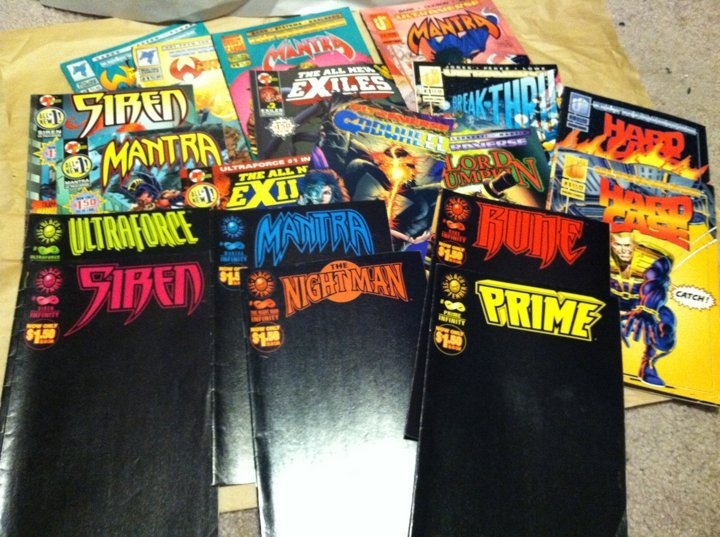 So between the 5-cent comics and pretty solid runs of Grendel, The Ferret, the Superboy series based on the tv show, and Resurrection Man…I walked out Friday with a full longbox and the equivalent of about half a shortbox, all for only slightly more than the cost of 8 or 9 new comics. 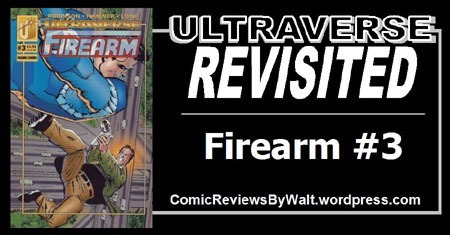 A few weeks ago, a Facebook group I had joined some years back–for the long-dead comics universe, the Ultraverse–suddenly exploded into activity. 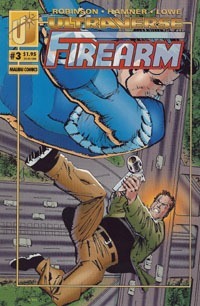 It’s been stirring my interest back up in the Ultraverse comics. 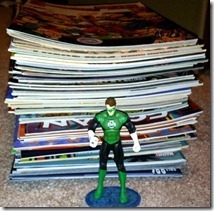 I already had a stack of PRIME issues on a shelf, waiting for a re-reading project I’ve had in mind for over a year. In addition, this past weekend I snagged a handful of Ultraverse comics from quarter bins at a couple different comic shops. 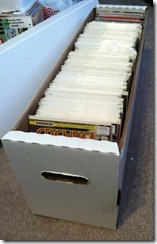 Monday night, I decided to take a peek in my “most accessible” longbox, and lo! 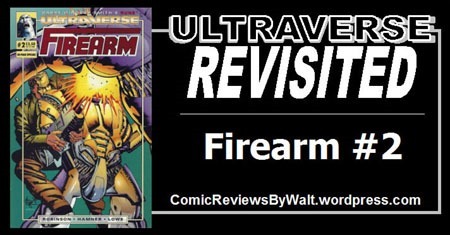 Ultraverse comics! 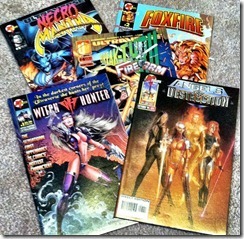 So I pulled the Ultraverse comics, and decided to look at the next box. Then the two shortboxes. 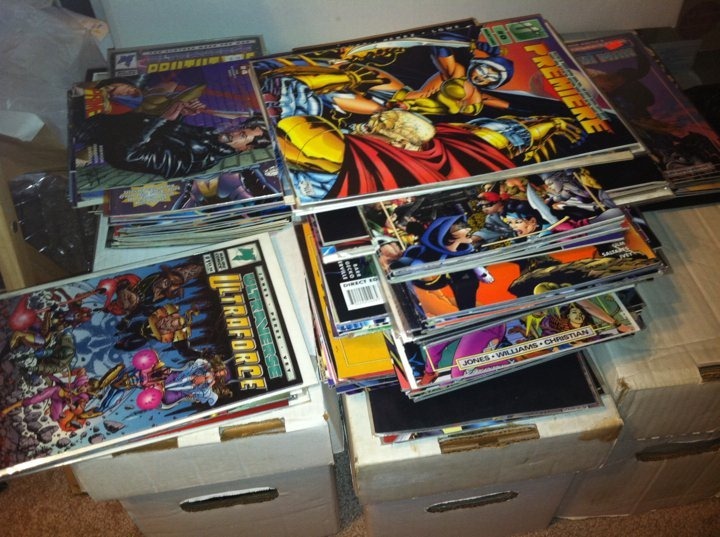 Amazingly, I found QUITE the mix of Ultraverse comics in just 3 longboxes and 2 shortboxes. Seems that without particularly realizing it, I’ve actually been grabbing a number of Ultraverse comics the last few years from various bargain bins and such sales. I even found that I’ve got the Black September: Infinity issue, as well as the Ultraverse: Future Shock. And turns out the that special PRIME issue I picked up a couple years back for $1 at a used media store is one of those Limited-5,000 editions. So, now have a mission before me: to dig through all the longboxes I have in this apartment, to pull together whatever Ultraverse comics I have. From there, see what’s out there that I’m missing, and begin very specifically hunting these things down.